Great observations on art from one of my most respected artists! 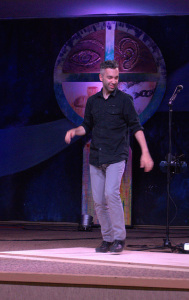 At a recent Creative Church Conference, I was asked by director Jessie Nilo to collaborate and accompany Andrew Nemr, a tap dance virtuoso, educator, choreographer, and TED Talk Fellow. The idea was simple: Andrew would share his story, both verbally and with expressions of dance, and I would be available on stage to interact with him musically throughout the hour-long performance. The thing was, this interaction would be completely unscripted and improvised. A simple idea—but as I had never accompanied a tap dancer before, I realized from the onset that this would bring me to the edge of creative risk.